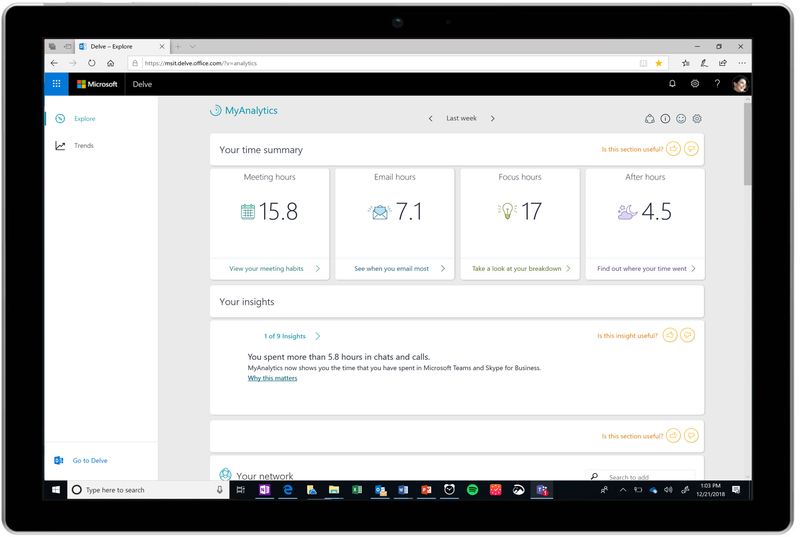 MyAnalytics—the fitness tracker for work—will be available to everyone using Office 365 and Microsoft 365 Enterprise and Business suites that include Exchange Online. Previously, MyAnalytics was only available with an Enterprise E5 plan or as an add-on to E1 and E3 plans. Via a personal dashboard, an Outlook add-in, and weekly emails, MyAnalytics summarizes how you spend your time at work, then suggests ways to work smarter—from cutting unproductive meeting time to reducing time spent working after hours. It even uses artificial intelligence (AI) to help you stay on top of your to-dos by flagging commitments you’ve made in email. As we continue to evolve the product, today we’re also making MyAnalytics insights more well-rounded. MyAnalytics currently provides insights based on time spent in Outlook emails and meetings, and Skype for Business calls and chats. This month, we’re adding new insights based on your Microsoft Teams calls and chats, as well as signals from documents you’re working on that are saved in OneDrive and SharePoint. With 329,000 organizations and 87 of the Fortune 100 using Teams, this takes us one step closer to providing you with a more complete picture of how you’re spending time at work. MyAnalytics Outlook add-in and weekly email. A recent Gallup study found that two-thirds of full-time employees say they experience burnout at work. Multiple factors are contributing to burnout—such as the increased pace of work, a rise in collaborative work like chats, emails, and meetings, and the continuing trend of technology blurring the lines between work and life. Our customers tell us they’re looking for ways to address these challenges by helping employees find time to focus, improve work-life balance, build better meeting habits, and create deeper connections with their colleagues. By making MyAnalytics features more broadly available to our millions of customers, it is our goal to make work days around the world a little more balanced and fulfilling. Q. 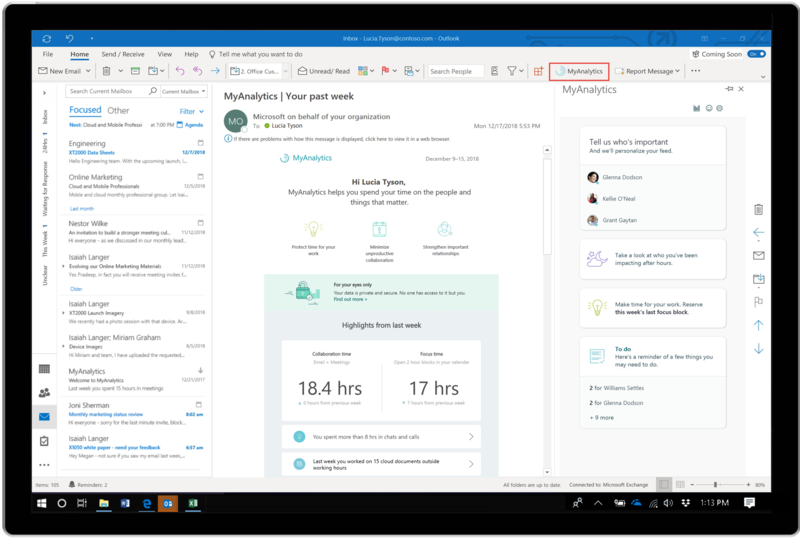 When will insights from Microsoft Teams and documents saved in OneDrive or SharePoint begin showing up for customers? A. This functionality began rolling out to existing customers with MyAnalytics in January 2019. Learn more in this article. Q. With these updates, what Office 365 and Microsoft 365 plans will include MyAnalytics? A. MyAnalytics features will now be available for Microsoft 365 E5, E3, and Business plans. They will also be available for Office 365 E5, E3, E1, Business Premium, and Business Essentials plans. Prior to these updates, MyAnalytics was only available as part of the E5 suite, or as an add-on to E1 and E3. Q. When will MyAnalytics start showing up for customers on these new plans? A. MyAnalytics functionality will roll out in phases, beginning with the Outlook add-in. The dashboard and weekly digest emails will roll out over time. In April, admins will begin to see a toggle in the Exchange Admin Center that supports tenant-level management of MyAnalytics functionality. Learn more in this article. The add-in functionality will begin rolling out to end users in May. Note: Today, we’re also announcing new security and compliance packages for our enterprise customers. 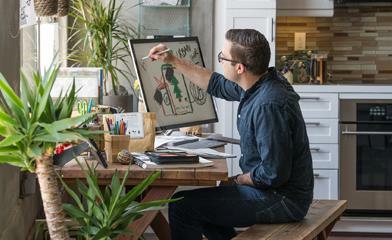 Please read Introducing new advanced security and compliance offerings for Microsoft 365 to learn more. This post was updated to clarify availability of MyAnalytics features.